Working with social networks inside a mobile app is very common nowadays. The recent versions of iOS have integrated to their SDK the capability to integrate social frameworks like Twitter, Facebook and the latest versions Vimeo. 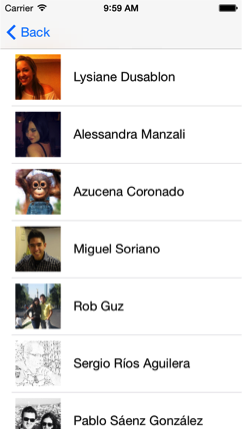 In this post I’ll show you how to compose a post and how to show your friends list inside your app. 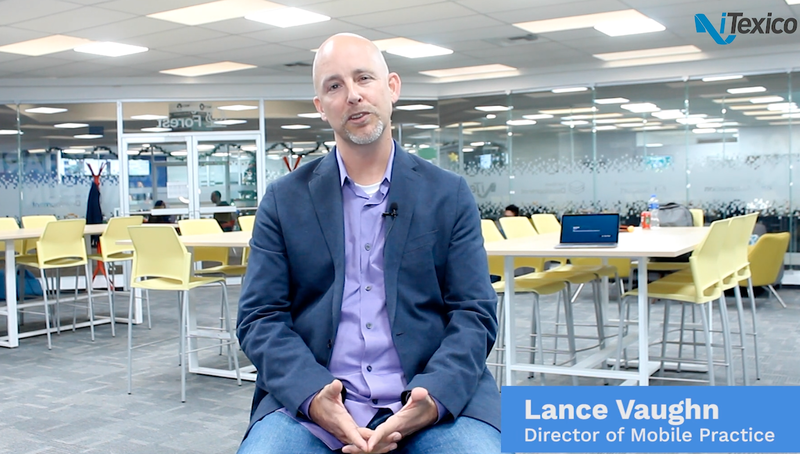 There are many things that could be done with the Facebook framework. So first, let's define what is the Facebook graph API. The Graph API is the principal way to retrieve, post or delete data from the Facebook's social graph. It's a low-level HTTP-based API that is used to query data, post new stories, and upload photos and many other things that can be retrieved in their developers page. For this blog I'll build a simple application with a table view that will show us two options. One will allow us to post a new message in our Facebook wall, and the other one will retrieve our list of friends in a different tableview. 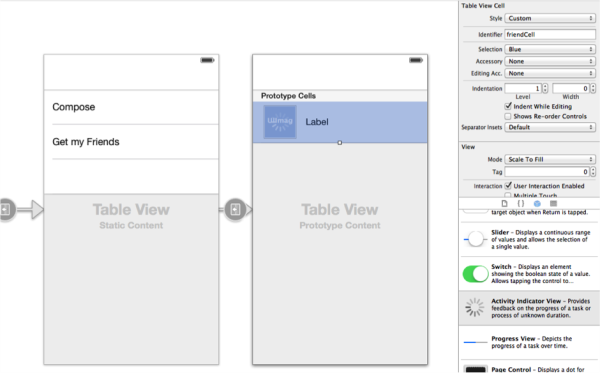 The first step is to create a new xcode project with a Single View Application Template. 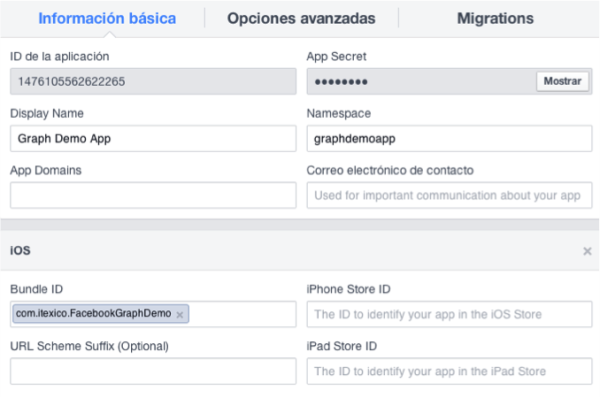 The name of the Application will be "FacebookGraphDemo" with a class prefixed named "FacebookGraph". Select iPhone as device family. Click next and create the project. Now that we're inside the project lets create the interface that we'll use. Take a look at the sidebar that is at the left of your screen and click on the file that is named "Main. storyboard". First, we'll drag a UIButton from the elements that are shown in the right-side bar at the bottom. 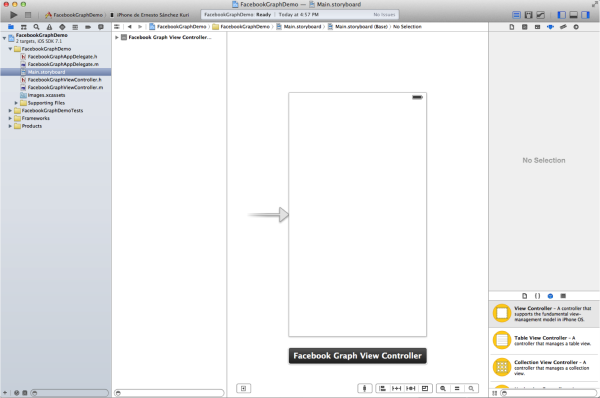 This button will be inside the Facebook Graph View Controller View that you see in the storyboard. Change the title of the button to "Facebook". Once you do this, add another element from the right-side bar named Table View Controller beside the controller that you already have. The next step is to create the view controller file that will get the methods to handle our view that we just added. Click on File>New File. 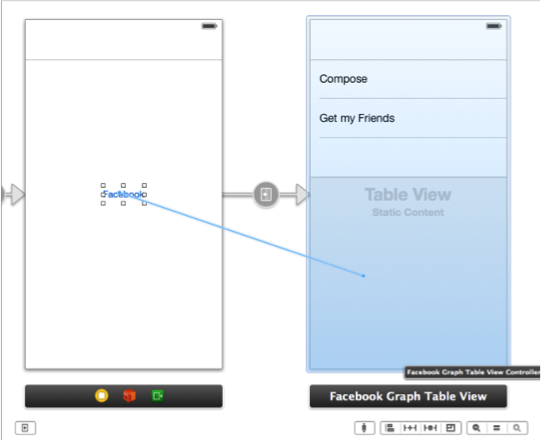 Create an Objective-c file with the name of FacebookGraphTableViewController from the subclass "UITableViewController". To connect your storyboard view, with this file go back to the storyboard and select the table view controller that we added and select the identity inspector in the right-side bar. Select the Class picker under the Custom class section and select the "FacebookGraphTableViewController" option that appears there. Click on the first cell, change the style to basic and rename the title of the cell to "Compose". Repeat the same steps on the second cell and rename it to "Get my friends". Now that we have our two view controllers we will connect them. At last, to finish the first part of the Interface Builder click on the first controller and then select in the top finder bar the option Editor > Embed In > Navigation controller. This will let us make the navigation between the two screens. At this point, if you run your application you will be able to change between screens. You'll notice that the tableview will be in blank. We'll get to it in the next step. At this point we're able to run our app and see the main table with the two options. The first one will be available to compose a new Facebook message if the device has a Facebook account subscribed. For our next part, we're going to make the function so the app can connect with the graph API and retrieve a list of the user friends in a table view. 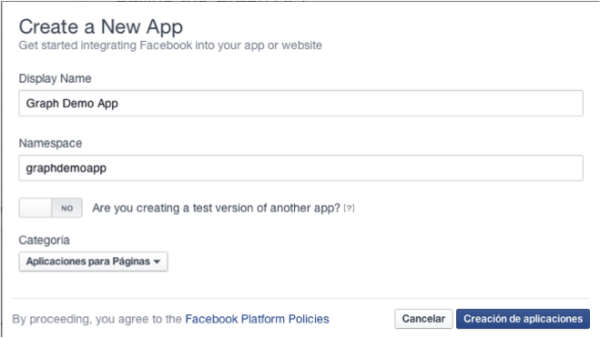 Before continuing with this we'll need to access to the Facebook developer site in order to set a new application that could connect with our iOS application. For the next step go to the configurations and add a new platform that will be available with our app. Click on the iOS option, you'll be returned to the configuration window. In the field that says "bundle id" set the same bundle id that is set on your xcode app. Save the changes and copy the Application ID that appears at the top, we'll use it later in our application. After configuring this, it will be necessary to create another Objective-C file. We'll name this file FBFriendsViewController. 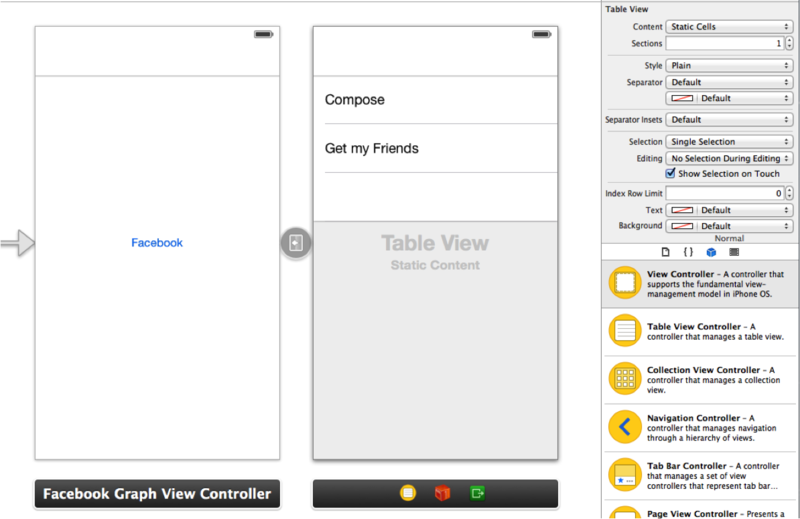 Be sure to create it as a subclass of UITableViewController. Go back to the storyboard and associate the table that we created with the Objective-C file as we did it before. Open the FacebookGraphTableViewController.h file and add the missing lines that you see below. At this point we're almost over with the application. Our main method for the function that we want to execute is the "getFacebookFriends: (FriendsCallbackSuccess) success error:(FriendsCallbackError) error". This method calls the Graph API directly with the SLRequest function. In order to get the data we need to send some permission and some parameters to the request. Once these are set, we'll receive the data and we will convert that data into a JSON. From this JSON we'll get an array containing all the data that we requested in the parameters from each user. After receiving each user as an object inside the array, we will generate a dictionary for each of them and store them in another array. This array will be sent in a success call. The only missing part for this is how the FBFriendsTableViewController is going to handle this array. For this we'll add the following code in .h and .m files. This part of the code is the visual interface that the user will be able to see with the name of his friends and their pictures. This data was sent previously within an array that we generated in the past table view controller. We fill the table with the dictionary that was created for each user. Our final result should look similar to the screen below. There are many methods that could be executed using the graph API. There are POST, GET and DELETE methods that could be called directly from our apps using the right permissions. Many applications like Spotify, Shazam, or games at the app store use this API so you can retrieve your friends, pictures, or other things from your Facebook account. I'll recommend you to visit the developer site to check which other permissions are available and also to debug your API calls with the graph API explorer that could be found in Facebook Developers page. This is a really useful tool to check which API calls are possible and which permissions you need to add. Ernesto S. is a Technology and Communication Engineer. He has been working on iOS mobile app development for 2+ years. Ernesto is a full Native iOS software developer.